RARE GROOVES Cultish collectors may recognize this album cover. To most music fans, Sopwith Camel are a classic one-hit wonder—if they're remembered at all. Their whimsical "Hello, Hello," propelled by a bouncy, vaudevillian tack-hammer piano accompaniment, was an unlikely calling card for the burgeoning San Francisco music scene when it cracked Billboard's Top 30 in January 1967. Not that Sopwith Camel were embraced by their hometown. In fact, the group's lead singer and primary songwriter Peter Kraemer recalls Jann Wenner editorializing in an early issue of Rolling Stone that since the group "had signed with a New York record company, [they] were not to be considered a San Francisco band any more"—all because they had agreed to work with Erik Jacobsen, the hot hand behind the Lovin' Spoonful. "He thought 'Hello, Hello' was a hit and he wanted to record us," Kraemer shrugs. Despite being regular performers at such seminal S.F. clubs as the Matrix and the Firehouse, the Camel were out on the road, opening for the Spoonful and missed out as the S.F. scene took off. Subsequently, Kraemer continues, "I found out that most people think [Sopwith Camel] was a put-together studio band by some New York producer. The funny thing is, of all the bands people call San Francisco bands, we were the only ones actually originally based in San Francisco," unlike those émigrés from the Peninsula that became the Dead and the Airplane. A self-titled, but delayed, debut album fared poorly, and their second effort five years later, The Miraculous Hump Returns from the Moon, was barely noticed. That rather eccentric disc, recently reissued on CD, features such songs as "Coke, Suede and Waterbeds" alongside more, uh, improbable subjects like "Astronaut Food" and "Monkeys on the Moon," tunes that Kraemer sees as perfectly suitable for the times. "I don't think I was any further off the beaten track than John Lennon or Keith Richards and Mick Jagger, as far as subjects," he says, just slightly defensively. "I mean, they talked about everything." Fast forward to 2005, when Kraemer visited his friend, promoter Chet Helms, shortly before the Family Dog founder's death. Inspired by that, and a health scare of his own, Peter resolved to round up a new Camel for one last go-around. "I call it late-life rock and roll," he quips. He didn't have to search very far; three fifths of the current lineup—which headlines a campaign event for Santa Rosa City Council candidate Caroline Bañuelos this week—are drawn from the original quintet. And, yes, they still perform "Hello, Hello." 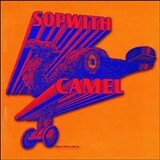 Sopwith Camel play a campaign fundraiser for Caroline Bañuelos on Friday, June 22, at the Howarth Park gazebo. 630 Summerfield Road, Santa Rosa. 4:30–7pm. $10–$20 suggested donation. 707.583.9603.